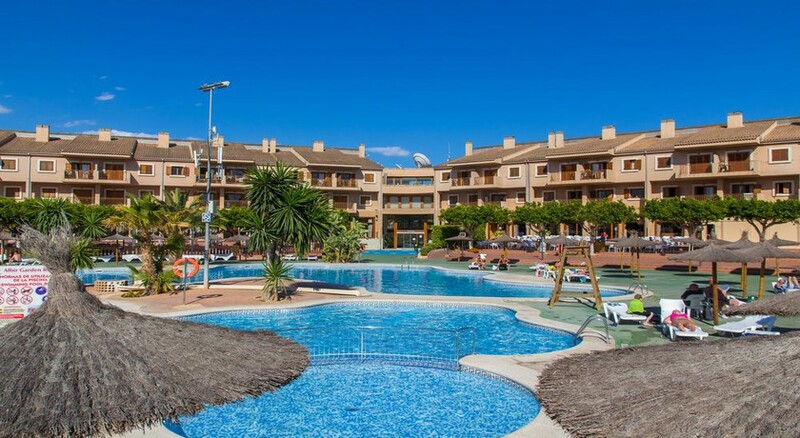 Set in the heart of Costa Blanca and very close to the lively resort of Benidorm, Albir Garden Resort is a perfect choice among couples, families, group travellers and young adults. Close to the Blue Flag beach of Playa de Albir, this all inclusive 3-star resort is not only children-friendly but also pocket-friendly. There are 426 well-appointed apartments distributed in 12 blocks with a ground floor plus two upper floors. The buffet restaurant serves delectable International dishes and offers views of the pool and garden. The large garden areas and the children’s playground allow maximum recreation for young guests. For guests that like to make a splash, another unmissable attraction is the on-site water park with a splash-tactic 16 slides. The resort also features lounge bars, a professional sports complex, swimming pool, jacuzzi, sauna, gym, Turkish bath and entertainment aplenty for adults and kids alike, with newly renovated facilities sure to provide everything you need. Albir Garden Resort Costa Blanca is located in Alfaz del Pi, Playa de Albir and is only 1.5km from the gorgeous sandy beach. Benidorm is also in close proximity – with the popular Playa de Levante beach just a 10-minute drive away. Guests can travel to Benidorm’s other major attractions such as Aqualandia water park (7.7km), Terra Mitica theme park (13km) and Melia Villaitana golf course (13km). Built within a large landscaped garden, the resort is close to restaurants, shops and cafes. The nearest airport is Alicante Airport, located 62km away from the property. Spacious, well-furnished apartments and superior lodges divided into standard and superior rooms constitute accommodation at Albir Garden Resort. Guestrooms can accommodate between 2 and 4 guests and come fitted with a living room area, sofa bed and separate bedroom, a furnished terrace with splendid views, en-suite bathroom with amenities, telephone, air conditioning or heating, high-speed Wi-Fi (chargeable) and a plasma TV with satellite connection. Each room also has a kitchen fully-equipped with a microwave, toaster, electric kettle and basic kitchenware and cutleries. The hotel has a buffet restaurant that serves breakfast, lunch and dinner. Guests can enjoy great views of the garden and the swimming pool while dining, or sit on the alfresco terrace during summer. The food reflects local and international flavours, and there’s a selection of up to 14 different menus on offer. Guests under the all inclusive programme have a wide choice of food and drinks available from 10am to 12pm. Albir Garden Resort also features a lounge bar/café with pool views where liquors, cocktails and non-alcoholic drinks are served. Albir Garden Resort Costa Blanca is a perfect choice for water lovers. The hotel has two outdoor pools for adults and a paddle pool for kids with facilities for water games. It also offers a heated swimming pool from November to April. A fully equipped gym is provided, along with a wellness centre that comes fitted with a Turkish bath, beauty salon, sauna, steam room, massage room, Jacuzzi and solarium. 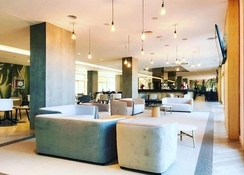 In addition to the gym, guests can also check in to the professional sports complex, which features football pitches, running tracks and world-class sports facilities - making Albir Garden Resort a popular choice for Olympic champions and international sports teams training in Costa Blanca. You can look forward to recreational facilities, including slot machines, billiards, darts, table tennis, board games, volleyball, cycling, aerobics, kids’ playground, mini club and a number of activities for all age groups throughout the year. But nothing can beat the breathtaking Aquagarden Park – the on-site waterpark that offers over 16 different slides ranging from four meters to 10 meters high! We informed you that Albir Garden Apartments, (Costa Blanca/Alicante, Albir) is undergoing renovation works which are taking place in Blocks G, D, I and the main building, including bar-salon, starting from January the works will also affect the restaurant and reception. Stayed here last September and it was a cheap getaway so I wasn’t really expecting a lot for the money I paid. Myself and my 3 year old son went for a quick week away and the hotel itself is brilliant for that and the staff are lovely. The food let’s the hotel down and if they addressed this issue I’m sure guests would have a lot better things to say about it. The aqua park is a great addition for all kids and my son loved it. There was a function on one of the nights in the hotel in which a bus full of old age tourists arrived and the hotel couldn’t cope with additional guests in the restaurant which made the ques for evening meal ridiculous. We went to McDonald’s due to this as I didn’t want to wait in the que with my son for an hour. The only down side of the holiday. It was pleasant, rooms were clean, little outdated but clean. You get what you pay for and it was fine. Fantastic price, location, food. Staff were wonderful clean rooms and lovely family hotel.